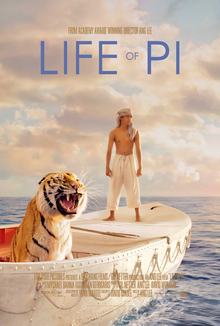 Ang Lee continues to demonstrate his impeccable auteur ability to adapt his technical and artistic skillset to practically any cinematic material with Life of Pi, an exquisitely rendered adaptation of the best-selling novel about an Indian teen stranded on a lifeboat with a Bengal tiger. Precisely what Lee’s film is emblazoning upon our visual memories with its galvanizing images is perhaps less laudable, mind you. For all of the considerable old-fashioned storytelling verve displayed by Yann Martel’s novel, it was also a work of strangely unreflective orientalism and fuzzy-edged spiritual theism. On the page, Life of Pi was a great read whose themes and conclusions grew less convincing and resonant the more they were reflected upon. On the screen, it’s a similarly memorable vision whose eventual implications evaporate sweetly. The screenplay by David Magee adapts Martel’s novel with surprising directness and completeness. The aforementioned Indian teen, Pi Patel (played by Suraj Sharma), is born and raised in Pondicherry, in French colonial India, where his family runs a zoo. He learns to swim, to enumerate the mathematical digits of his self-given nickname (his full, twee name is Piscine Molitor Patel, after his uncle’s favourite swimming pool), and to know God in many, non-contradictory forms through the traditions of Hinduism, Christianity and Islam, despite the disapproving rationality of his father (Adil Hussain). This relatively idyllic period of the titular life is not fated to last, however; his father, alarmed by political and social developments in the modernizing country, decides to sell off the zoo’s animals and move his family to Canada to make a fresh start. With Pi’s family as well as their animals on board a freighter crossing the Pacific Ocean, a fierce maritime storm claims the ship, leaving Pi as the only human survivor aboard a lifeboat also occupied by a zebra, an orangutan, a hyena, and a tiger whimsically named Richard Parker (Martel is referencing the cannibalized sailor in Edgar Allen Poe‘s The Narrative of Arthur Gordon Pym of Nantucket with the name, as well as similarly-dubbed shipwrecked figures throughout nautical lore). The experience of reading Martel’s novel made it clear that the author knew the tiger-in-the-lifeboat thing was his hook, to use a pop music term (so much so that he plagiarized the crackerjack idea pretty much directly from a Brazilian book without much apparent hesitation). Lee’s film, strong enough in its establishing section, takes on a transcendent bravado once the lifeboat is in the water. Noticeably, the framing scenes of a middle-aged Pi (the wonderful Bollywood star Irrfan Khan) recounting his tale to the straight-man fictionalized version of Yann Martel himself (played as a vessel for receiving the wondrous by the always-worthy Rafe Spall) drop away almost completely as the story of Pi’s tense seabound coexistence with Richard Parker ramps up into full, glorious gear. And glorious it is. Life of Pi is pure, experiential, transportational cinema for its fantastic central half-to-two-thirds. Kickstarting with the freighter’s gut-churning demise in the midst of a nocturnal squall (a sequence of wide-eyed but terrifyingly realistic scope that makes the sinking of James Cameron’s Titanic look like a garish tantric tapdance in comparison), the adventure-story element of the tale is brilliantly envisioned by Lee and his team. The fastidious details of Pi’s survival practices are imparted with intelligence and humour, the mortal threats that face him feel real and menacing, and the sheer, overwhelming beauty unleashed by Lee on several occasions cannot be easily shaken. He shows us a man who appears to swim briskly through a blue sky, the lifeboat cosmically alone in a near-infinite field of stars and on a glassy reflected sunrise, a breeching whale twinkling with bioluminescent sea plankton, and millions of meerkats standing in unison on a mysterious and foreboding island. Oops, spilled all of my Listerine. The film’s greatest visual effect is Richard Parker, a practically photo-real CGI tiger whose movements and behaviours appear translated directly from a nature documentary. Whatever his relationship, real or imagined, natural or narrative, to Pi, Richard Parker is a fully-realized being, his wild beast actions intercut with recognizable housecat ticks to engender sympathy and identification. It’s a wholly different and yet entirely convincing approach to a computer-created screen creature from that pioneered by Andy Serkis in King Kong and Rise of the Planet of the Apes. There is no actor behind Richard Parker, and that’s why this evidently-real tiger seems to so credulously inhabit that small lifeboat. If only the film that includes him could credulously inhabit a similarly indefatigable thematic vessel. Because although Life of Pi is a technical triumph, a prodigious entertainment, and an absorbing visual creation, it’s also a cornpone metaphor for religious faith. For all of its merits, it still comes across like something that a frippery-dabbling Salman Rushdie might have written after consuming too many cupcakes and too much Tang (just enough of both to make him forget that religious fundamentalists put a price on his head). Pi is a sort of post-multiculturalism, tri-faith Job, beset by seemingly divinely-sent ordeals that galvanize his syncretic, inclusive beliefs rather than causing them to falter. Martel rather uncomplicatedly set up the exotic orientalism of his narrative as a balm of spiritualism direct from the profound East, even writing himself into the book as the uncertain Western conduit for this far-flung existential wisdom. Ang Lee does not shift a hair on the story’s metaphorical head, even if one wishes he might have. His Pi is Martel’s Pi, for good or for ill.
As the final of the book and film’s “elegant proofs of God” (to employ a phrase that Barack Obama used in a letter to Martel), the revelation that Pi gave two different stories to investigators from the Japanese shipping company that owned the lost freighter is evidently the most resonant. Or rather, our clear preference, as expressed by the fictional Martel, for the tiger narrative over the gory, Hobbesian human-centric account that the animal-inflected story may well have been a subconsciously-concocted coping mechanism for, is the stirring coup de grace for enlightened theism. The human preference for fanciful, artful inventions in our storytelling may narrativize God in order to make him intelligible (or less so), but it need not make us believe in him. In the same way, the supremely artful inventions that Ang Lee gives us in his film of Life of Pi do not make its theological conclusions any easier for a rational, skeptical populace to swallow. We like the story with the tiger, but because of how it looks, feels, and computes for us, not because of what it ultimately is taken to mean.